by Tommy Goudge (July 29, 2013) – 96 drivers signed in to race on “Northern Summer Nationals” night presented by Burger Barn at Ohsweken Speedway on Monday. 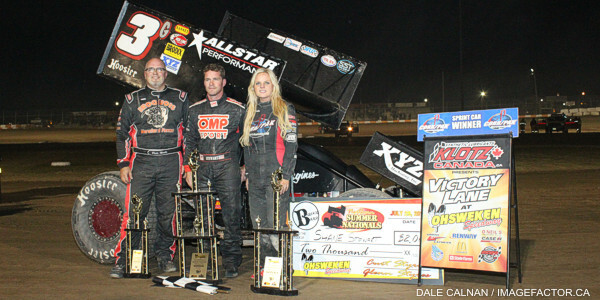 Shane Stewart, Chad Brachmann, Davey Boughton, and Jesse McDonald visited Klotz Canada Synthetic Lubricants Victory Lane. 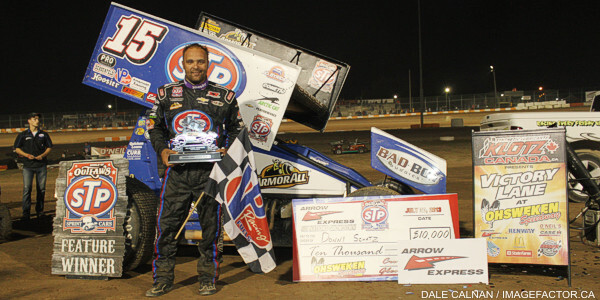 Regular Friday night racers Tom Huppunen and Glenn Styres made up the front row for the special 25 lap Sprint Car feature, with a guaranteed starting spot in September’s Canadian Sprint Car Nationals on the line for the winner. Invaders Shane Stewart and Tony Stewart started right behind them in row 2, and quickly took over in the 1st and 2nd positions. All eyes were on the front of the field, as Tony chased Shane through traffic for much of the race. Kyle Moffit brought out a yellow flag on lap 17 when he spun while fighting for a top 10 spot. Tony used the restart as his opportunity to make a move for the lead, and he and Shane traded slide jobs before Tony caught the cushion in turn 3 and flipped wildly to bring out a red flag on lap 18. The 3 time NASCAR champion climbed from his damaged machine uninjured, but done for the night. Glenn Styres had fallen back to 4th, but moved back around Jessica Zemken for 3rd just before Tony’s crash, and was in position to race Shane for the lead when the race restarted. Shane set a torrid pace while Styres tried to keep up, but Glenn got over the cushion in turn 2 and flipped on lap 23. He was also uninjured, but not able to finish the race. Shane Stewart cruised to the win, with Zemken 2nd, Dain Naida 3rd, Jamie Collard 4th, and Mitch Brown 5th. Heat races for the 29 car field went to Shane Stewart, Tom Huppunen, and Travis Cunningham, while Shane Ross won the B-Main, and Tony Stewart won the Nathan Ackland State Farm Insurance “Top Gun” Award for accruing the most heat race passing points. Brandon Easey and Billy Bleich, Sr. made up the front row for the first 358 Modified feature at Ohsweken since 2008. Easey led the first 6 laps before Chad Brachmann took over, and began to open up a lead. Great racing ensued throughout the rest of the field, with several 3 wide moments. Brachmann got faster during the second half of the feature, and ran the fastest lap of the race on lap 25. He was slowed only by a pair of yellow flags, and won the 30 lap feature by more than 5 seconds. Mat Williamson got the runner-up spot, followed by Mark D’Ilario, Chris Steele, and Erick Rudolph. Heat races for the 20 car field were claimed by Brandon Easey and Billy Bleich, Sr.
Mark Verhuel and Mike Giberson were the front row starters for the Mini Stock feature, but several drivers quickly made their way to the front from outside the top 10, with Davey Boughton eventually taking the lead. Boughton pulled away to the feature win, and took over the points lead again as a result. Laura Hughes, Tyler Lafantaisie, Robin Elliott, and Rodney Rutherford chased Boughton to the finish line. Mark Verhuel, Jonathan Ayrton, and Mark Czuba won the heat races for the 31 car field, while Jason Lungaro won the B-Main. Skip Brandow and Clinton Nicholls had the front row starting positions for the Bomber feature, but Jesse McDonald made his way to the front and negotiated traffic to get the feature win. Mark Bazuin, Max Chechalk, Tim DeBoer, and Wayde Thorne rounded out the top 5. Heat races for the 16 car field were claimed by Jesse McDonald and Brady Longboat. Advance reserved seat tickets are now on sale for the 9th annual Canadian Sprint Car Nationals coming up on Friday, September 13, and Saturday, September 14. Please visit www.OhswekenSpeedway.com and check out our new system for online ticket sales. 1. 3g Shane Stewart (Pittsboro, IN), 2. 30g Steve Goldner (Aylmer), 3. 67c Steve Collins (Belfast, NY), 4. 1z Jessica Zemken (Sprakers, NY), 5. 9nz Havard Daniels (Coatesville, NZ), 6. 94 Stan Zanchin (Fort Erie), 7. 5 Keith Dempster (Alton), DNS. 9 Jim Munsie (Pickering), DNS. 67x Gord Bennett (Cambridge), DNS. 01 Mikey Kruchka (Hamilton). Time – 1:50.258. 1. 27h Tom Huppunen (Fenwick), 2. 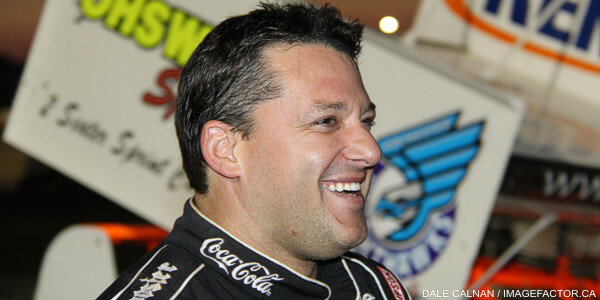 14 Tony Stewart (Columbus, IN), 3. 0 Glenn Styres (Ohsweken), 4. 14h Jim Huppunen (Fenwick), 5. 7x Jamie Collard (Burford), 6. 80 Chris Steele (Fenwick), 7. 81 Derek Jonathan (Lewiston, NY), 8. 5c Conor Mahoney (Waterdown), DNF. 90 James Evans (Beamsville), DNF. 11 Jamie Turner (Caistor Centre). No Time. 1. 71 Travis Cunningham (Grimsby), 2. 37 Kyle Moffit (South Dayton, NY), 3. 07x Dain Naida (Tecumseh, MI), 4. 7m Justin Martin (Shedden), 5. 49 Todd Hoddick (Cheektowaga, NY), 6. 10 Mitch Brown (Brantford), 7. 3r Shane Ross (Thedford), 8. 10j Jeremy Hughes (Burlington), 9. 43 Scott Sherk (Port Colborne). Time – 1:52.309. 1. 3r Shane Ross, 2. 5 Keith Dempster, 3. 01 Mikey Kruchka, 4. 94 Stan Zanchin, 5. 5c Conor Mahoney, 6. 43 Scott Sherk, 7. 10j Jeremy Hughes, DNS. 9 Jim Munsie, DNS. 11 Jamie Turner, DNS. 67x Gord Bennett, DNS. 90 James Evans. Time – 2:21.947. 1. 06 Brandon Easey (St. Catharines), 2. 71 Mike Bowman (St. Catharines), 3. 6 Mat Williamson (St. Catharines), 4. 38 Ryan Susice (Ransomville, NY), 5. 72 Tommy Flannigan (St Catharines), 6. 25 Erick Rudolph (Ransomville, NY), 7. 28 Todd Gordon (St. Catharines), 8. 96 Fred Carlton (St. Catharines), 9. 777 Tyler McPherson (St. Catharines), 10. 108jr Nick Cupolo (Thorold). Time – 2:10.846 NEW TRACK RECORD. 1. 108 Billy Bleich, Sr. (Port Robinson), 2. 3b Chad Brachmann (Sanborn, NY), 3. 08 Mark D’Ilario (Smithville), 4. 42 Pete Bicknell (St. Catharines), 5. 17c Chris Steele (Fenwick), 6. 12 Chad Chevalier (Port Colborne), 7. 11 Brett Clarke (Australia), 8. 37s Robby Krull (Cambria, NY), 9. 21k Randy Chrysler (Tuscorora Nation, NY), 10. 17p Pete Cosco (St. Catharines). Time – 2:15.382. 1. 53 Mark Verhuel (), 2. 99 Robin Elliott (Woodstock), 3. 69 Rob Twitchett (Dundas), 4. 66 Jon Janssens (Woodstock), 5. 1 Kathi Dickie (Brantford), 6. 11 Mike Giberson (Caledonia), 7. 22 Brittani Myers (Hamilton), 8. 76 Jamie Goudge (London), 9. 96t Mike Taylor (), 10. 84 Jade Pelletier (Wainfleet), 11. 12 Chantelle Hyatt (Wainfleet). 1. 21 Jonathan Ayrton (Dundas), 2. 7x Chase Hess (Ohsweken), 3. 16 Jeremy May (Binbrook), 4. 10 Laura Hughes (Puslinch), 5. 79 Steve Miller (Paris), 6. 18x Davey Boughton (Carlisle), 7. 66r Cole Rodwell (Caledonia), 8. 05 Dave Goodacre (Brantford), 9. 90 Chad Smelser (Dunnville), DNF. 69e Dan Erskine (Caistor Centre). 1. 02 Mark Czuba (Burlington), 2. 81 Alex Schuts (Oakland), 3. 96 Tyler Lafantaisie (Welland), 4. 114 Kyle Rothwell (Welland), 5. 47x Kyle Pelrine (Beamsville), 6. 38r Rodney Rutherford (Waterdown), 7. 7 Jason Lungaro (Hamilton), 8. 4 Rocco Conte (Welland), 9. 31 Mike Taylor (Burlington), 10. 55 Rob Slater (Dundas). 1. 7 Jason Lungaro, 2. 4 Rocco Conte, 3. 31 Mike Taylor, 4. 05 Dave Goodacre, 5. 66r Cole Rodwell, 6. 55 Rob Slater, 7. 96t Mike Taylor, 8. 76 Jamie Goudge, 9. 22 Brittani Myers, 10. 84 Jade Pelletier, 11. 90 Chad Smelser, DNF. 69e Dan Erskine, DNF. 12 Chantelle Hyatt. 1. 88 Jesse McDonald (Caledonia), 2. 97 Max Chechalk (Hamilton), 3. 42 Joe DeBoer (Hagersville), 4. 32 Gillian Hils (Dundas), 5. 43c Clinton Nicholls (Hamilton), 6. 03d Dakota Potts (Waterford), DNS. 36 Skip Brandow (Orwell), DNS. 155 Dustin Longboat (Ohsweken). 1. 66 Brady Longboat (Ohsweken), 2. 6 Wayde Thorne (Waterford), 3. 32h Trevor Roszell (Waterdown), 4. 9 Tim DeBoer (Caledonia), 5. 21 Mark Bazuin (Caledonia), 6. 23 Dusty DeBoer (Hagersville), 7. 188 Paul Longboat (Ohsweken), 8. 99 Amy Fitzsimmons (Woodstock). SPECTATOR GATES OPEN @ 3:00 P.M., RACING @ 7:30 P.M.
Ohsweken Speedway thanks the following sponsors for their support of the 2013 season: Arrow Express, Corr/Pak Merchandising Inc., Renway Fuels & Lubricants Heating & Cooling, O’Neil’s Farm Equipment, McDonald’s Restaurants of Paris & Brantford, Nathan Ackland State Farm Insurance, Klotz Canada Synthentic Lubricants, and Burger Barn.